Somewhat belatedly, here is the map of the final Alberta PC leadership election, district-by-district, after the redistribution of Horner's preferences to the final two candidates. The previous maps (First Ballot, Second Ballot) used a two-tone colour scheme to distinguish between a candidate receiving a majority or a plurality of the vote. Since, in a final, two-candidate count, every result will necessarily be 50% or more, the tones here distinguish big honkin' majorities (60% or more) from mere majorities of 50-something percent. Further to the previous, there's some wonkiness in the provincial budget estimates for FY 2005-06. 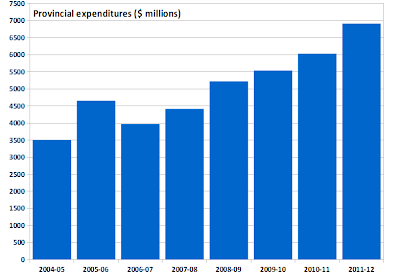 However, here's a different measure of provgov spending, based on Public Accounts data, going back to FY 2003-04, the last budget under the former provincial Liberal government. The large figures show the total provincial government's program expenditures (i.e., money spent on everything other than servicing the debt), in millions of dollars. 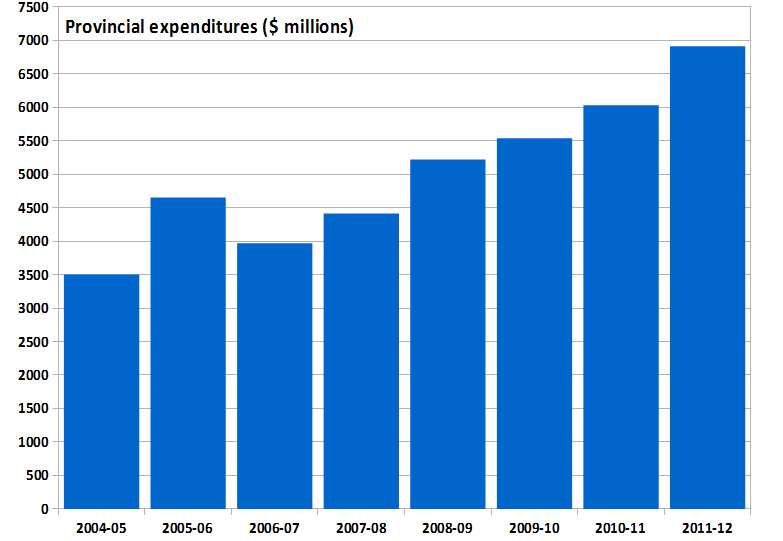 The smaller figures show the year-over-year change in program spending. Other than a modest decrease in their first year in office, with the attendant damage to his CRA ego ratings that ensured he'd never try that again, the "Conservatives" under Danny Williams never reduced program spending, making it really quite difficult for them to reduce "further" under Kathy Dunderdale. Note Danny Williams' parting gift to the more recent, right-hand side of the chart: between FY 2007-08 and his final year in office, provincial program expenditures were upwardly "reduced" by 35%. Dunderdale doesn’t agree with those who suggest government spending is out of control. In last year’s budget, she notes, new spending was around two per cent. “We’re going to try to reduce it even further,” she says. In order to reduce something further, don't you have to be reducing it in the first place? 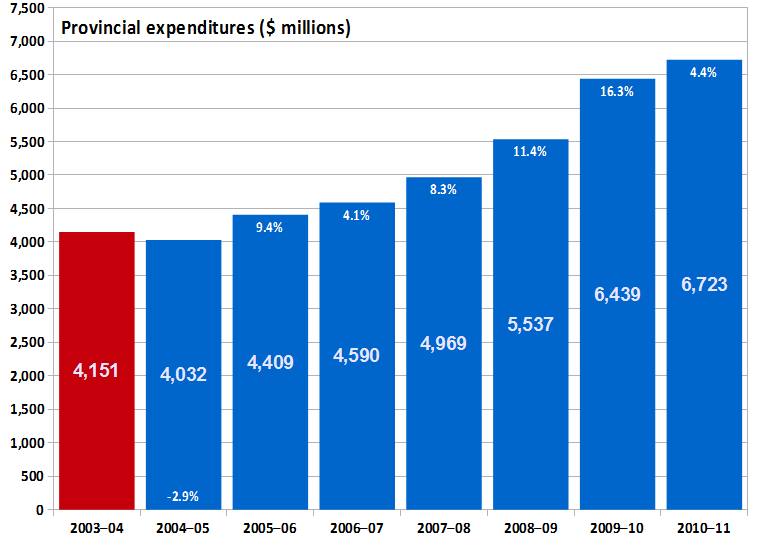 Other than FY 2006-07, the year-over-year increase in provincial program expenditures under the "Conservative" government has never been less than 6%. Quebec's Commission de la représentation électorale tabled its final report this past week, setting out the new electoral boundaries by which the next provincial election will be fought in the province (unless it is called before January 21st). There's lots more information here, and the Commission, as it did in the last redistribution, has created a wonderful interactive mapamajig that you can play with, comparing old and new boundaries. If your province's electoral office doesn't already do this, it's not to early to nag them into doing so. Of the 125 new electoral districts in Quebec, 39 are entirely unchanged from the former electoral map, including most of those in central and eastern Montreal. Some of the unchanged districts include Pointe-aux-Trembles, both of the Beauces, Crémazie, Mirabel, and Gouin. There are a further 19 former electoral districts which are transposed intact into new electoral districts, by the addition of polls from neighbouring districts. In some cases, the tinkering is minor, as in Bonaventure, which, otherwise unchanged, gains the municipality of Chandler from the former Gaspé. Similarly, Abitibi-Ouest gains a few polls from Abitibi-Est, or Groulx from Blainville. Other additions are much more substantial: all of the former Montmagny—L'Islet is rolled into the new Côte-du-Sud, along with a large chunk of the former Kamouraska—Témiscouata; the rest of the latter is combined with a bit of the former Rimouski and all of the former Rivière-du-Loup into the new Rivière-du-Loup—Témiscouata. All of old Matapédia is combined with most of old Matane into Matapédia—Matane; the rest of old Matane is rolled into the redrawn Gaspé. This leaves 57 electoral districts which have been cobbled together by combing mismatched parts from neighbouring former districts. In most cases, there is enough kernel left of one of the old districts that it has a successor in name and geography in the new map. However, there are several of these redrawn districts which have to be considered as entirely "new": Drummond–Bois-Francs, Granby, Lotbinière–Frontenac, Montarville, Saint-Jérôme, Sainte-Rose, and Sanguinet. Where a former riding is left intact, or almost entirely intact, all of its votes, including early votes, are attributed to the "new" riding. Where a former riding is left intact but combined with polls from a neighbouring former riding, all of the intact riding's votes, including early votes, are attributed to the new riding, along with all of the regular polls that are transferred from the broken-up riding. Where a new riding is comprised of portions of two or more former ridings, the new riding's vote is the sum of all of the regular polls that were combined to make the new riding. For the purposes of this exercise, advance and special ballots are discounted. For all rural and many urban riding changes, Elections Quebec's practice of grouping polls into "Secteurs", which respect municipal boundaries, makes it easy to transpose votes from the 2008 to the 2011 electoral boundaries. For 35 of the new electoral districts, involving changes in urban and suburban areas, GIS software made it possible to transpose votes on a poll-by-poll basis. In a small handful of cases (about five or six) estimates instead of exact counts were required, where new electoral boundaries split a former polling division between two electoral districts. Using these methods, the 2008 vote transposed into the new boundaries would yield 63 Liberal (PLQ) MNAs (-3 from 2008); 53 Péquistes (+2); 8 Adéquistes (+1); and one Québec Solidaire member (no change). This is assuming all things are equal. Of course, in Quebec these days, they are not. But please play along. The provisional exclusion of the harder-to transpose advance and special ballots would change the outcome in a number of districts which were closely-fought if you look at the regular polls alone. However, early voters in most parts of Quebec tend to skew quite strongly towards Liberals compared to the overall vote or the vote in regular polling divisions. Caveat lector. Abitibi-Est: Tilts from narrow PLQ to narrow PQ on the transposition; would probably tilt back to the PLQ column with the inclusion of early voters. Jean-Lesage: A narrow PQ gain from the PLQ in the transposition of regular polls, as it loses some Liberal polls in the east, and gains some PQ polls in the west, but this is another riding where Liberal-heavy early voting would easily make a big difference in a real election. Montmorency: The suburbanification of this riding narrowly favours the ADQ over the PLQ in the transposed regular polls, but could easily turn around once Liberal early voters are included. Trois-Rivières: Trois-Rivières swaps some electoral spit with Maskinongé to the west, with each riding giving up some polls to the other. The net effect, however, favours the PQ. This is also a rare case where early voters bucked the Quebec trend, and where the PQ more evenly matched the PLQ among advance and special ballots voters. Vanier–Les Rivières: Notionally tilts to the ADQ after its boundaries are rejigged, but solidly-Liberal early voters would give the advantage back to the PLQ. Drummond–Bois-Francs: A PLQ win over the PQ. Granby: An ADQ win, carved out of the former Shefford. The area around Granby was one of the few in Montérégie to survive the splintering of the 2007 breakthrough ADQ vote to the PQ and PLQ a year later. Lotbinière–Frontenac: Despite the ADQ strength in the former Lotbinière, this district transposes to the PLQ, based on the Liberal strength in the former Frontenac polls around Thetford Mines. Montarville: One of the new South Shore suburban ridings, it is a narrow (2%) PLQ win over the PQ in the transposition, but a more comfortable PLQ victory when early voters are included. Saint-Jérôme: A new riding carved out of a rapidly-growing, solidly PQ northern Montreal exurb. Sainte-Rose: A new Laval riding, narrowly Liberal on the transposition, more solidly Liberal once early voters are factored in, but likely to be one of the new Laval belwethers. Laval ridings have a long history of mirroring the federal and provincial outcome in Quebec. Sanguinet: The South Shore answer to Saint-Jérôme, another new riding carved out of a fast-growing, PQ-trending suburban area. A wise elf notes that some provincial legislatures, including the Newfoundland and Labrador House of Assembly, reconstitute themselves post-election by having a mostly-ceremonial sitting to swear in the members (and usually also elect a Speaker), followed, not necessarily in short order, by a Throne Speech, which may be many weeks later. In order to provide an apples:apples comparison, here is the same chart as posted on Wednesday, but amended to measure the break as between election day and the subsequent Speech from the Throne. While several provincial legislatures grow bigger gaps by this measure, that of Newfoundland and Labrador's House of Assembly in 2007 still takes the crown among the ten most recent re-convenings, today's in Manitoba not included. In the speech, MacDonald took several shots at Premier Kathy Dunderdale, saying she basically bought votes with “a truckload of money” in the days leading up to the provincial election. It is not entirely clear from the context how much money is in a "truckload". Are we talking a Mack truckload or a metric truckload? Meh, it doesn't matter. What does matter, is the rather more important question of the whereabouts of Dean MacDonald — he who is so very concerned about leadership and all that — between 2003 and 2011. Where was Dean, and his concern for leadership, and his eagerness to express that concern, as provincial public-sector spending, and the public-sector payroll, ballooned, especially in the past five fiscal years? Where was Dean, and his earnest, principled opposition to vote-buying, in 2007? 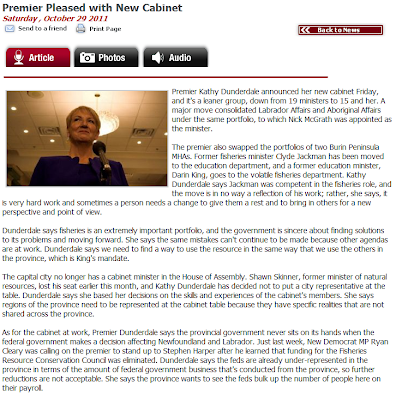 Deanie took a shot at Dunderdale. Fair enough, and well-warranted. Where were his gun and ammo while Danny Williams was in office? He also slammed Dunderdale for leaving the House of Assembly closed for most of the year. Where was his concern about disrespect when Danny Williams called the House of Assembly "wasted time"? Where was this man's opposition to arrogance in 2007, when Danny Williams gave his newly re-elected government a five-month break from the House of Assembly? When, as in every year since 2003 inclusive, the House of Assembly sat for fewer days than at least one territorial legislature? When it sat fewer times during Danny Williams' entire Premiership, than it did during the first four of that of Clyde Wells? Or when St. John's City Council has met as many, or more times than the Hous, in five of the past nine years? Where did he conceal his concern for parliamentary democracy and its institutions between October 2003 and October 2011? What spider hole was it lurking in all that time? On the divide between rural and urban portions of the province, he called it cheap politics, and destructive. Presumably, it was also the worst kind of politics back in 2006, when its practitioner was a guy named Danny Williams. Without a time machine to go back and figure out Dean MacDonald's whereabouts at that epoch, we will never know. But Macdonald also took aim at several of the Liberal party’s sacred cows — namely, Muskrat Falls and the divide between rural and urban Newfoundland and Labrador. The Liberal Party has aggressively attacked the plan to build a hydroelectric dam at Muskrat Falls in Labrador. But MacDonald said he’s convinced it’s basically a good idea, and a good deal. “While the debate will focus on the immediate, we have to think long-term again. If we build that thing, it’s there for 100 years,” he said. “When we think about a $6-billion investment in the Lower Churchill is expensive, well, talk to someone in 50 years. A long time ago, in a galaxy far, far away, there was a guy who shared Dean MacDonald's name, who melodramatically bailed from the board of Newfoundland and Labrador Hydro over his principled opposition to a different proposed Lower Churchill project. Mr. MacDonald said Newfoundland and Labrador should not sign the proposed agreement because it doesn't provide for significant amounts of electrical power to be diverted from the main transmission lines to proposed economic development in Labrador. Where is the modern Dean MacDonald's concern about the marginalizationof Labrador, or the affordability of power? Perhaps Dean MacDonald, like more than a few others these days, is developing a case of buyer's remorse. Or perhaps there's some other explanation for why there's at least three areas of public policy where Dean MacDonald was either silent, eerily silent, for as long as Danny Williams was in power, and one other where the 2011 version of Dean MacDonald is at odds with the Dean MacDonald from nine years ago. Dean MacDonald may genuinely be concerned about leadership, vision, and the future of the province. But Dean MacDonald is not a solution. He is a perfect encapsulation of the problem. But there ain't no flies on Manitoba. Just sixteen days after being re-elected, Greg Selinger's NDP government is re-opening the legislature for a fall session. All the elections are aligned on "E" day (for election). The bar to the left of "E" shows the duration of the election campaign. The election campaigns are colour-coded by season; brown for fall, green for spring, and Alberta's late-winter election in blue. An elections which resulted in the change of government is marked with an asterisk. The election campaigns are also portrayed proportionate to their length. Newfoundland and Labrador provincial elections are the shortest in the country by about eight days; and, no, the fixed election date is no excuse either, given that most of the other provincial elections were also run under fixed date legislation. 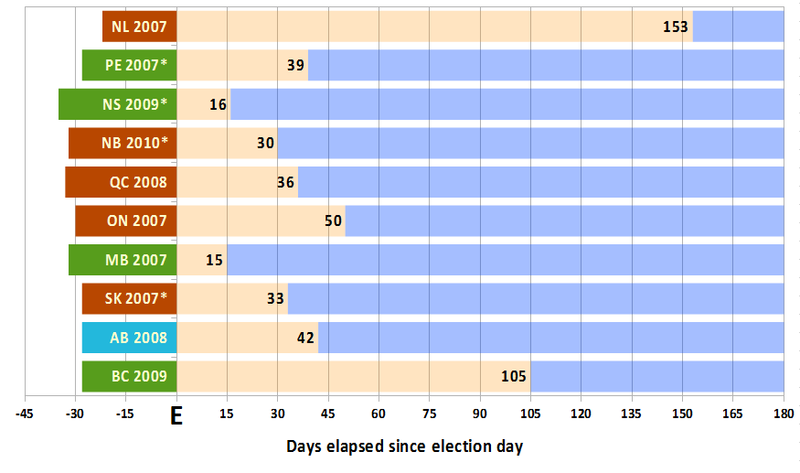 The peach-coloured bar represents the break between the election and the resumption of legislative activity, with the length of that gap indicated. The legislature sat during some or all of the time-period rendered in pale blue. After the 2007 election, the Newfoundland and Labrador House of Assembly did no reconvene for five months. Only British Columbia's break topped 100 days. 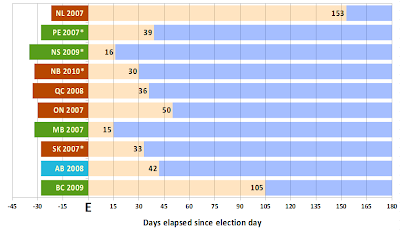 Re-elected or newly-elected governments in the nine provinces west of the Cabot Strait averaged 41 days after the election before reconvening the legislature. Excluding BC, the average drops to 33 days. 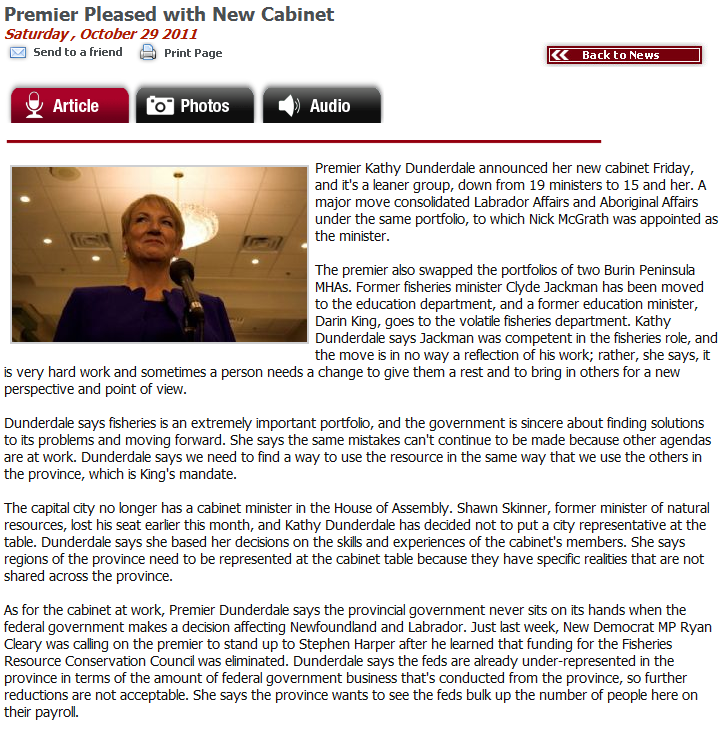 Premier Dunderdale uses the excuse that she has to shuffle her cabinet, get everyone briefed, and come up with some legislation to bring before the House. Almost her entire incumbent caucus and cabinet was re-elected last Tuesday. 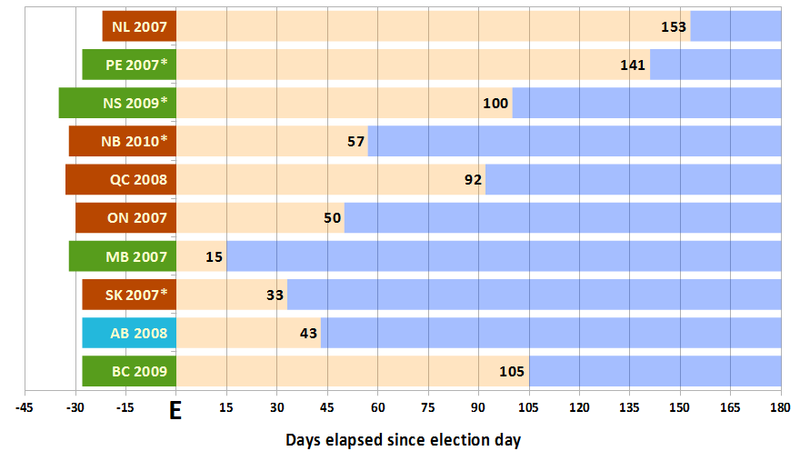 The last four newly-elected provincial governments (PEI, NS, NB, and SK), with completely new cabinets and legislative agendas, averaged just under 30 days before the legislature was back in session. Working forward from October 11, 2011, would allow MHAs a break until after Remembrance Day activities back in their districts, and a fall session of historically-typical length before heading back for the Christmas break. So much for Excuse No. 1. Then there's the alternative explanation that all the hard, busy work of shuffling minister and briefing them (presumably, as in the good ol' days of 2009 and 2010, with as little ATIPpable paper trail as possible) will take us into Christmas. And we can't have that. 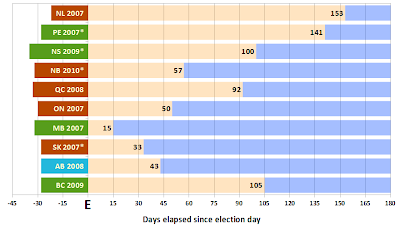 The four most recent fall provincial elections (other than in NL) saw legislatures resume after an average of 37 days. Two of those were also change-of-government elections. Again, a break of this length would allow the House of Assembly to return in mid-October, after Remembrance Day events, with an easy three sitting weeks thereafter slotting comfortable into just about any calendar anywhere else in the country. So much for Excuse No. 2. Election-year columns are indicated with an asterix. Note that both charts are at the same vertical scale. Between 2005 and 2009, over two election campaign cycles, business and corporate donors in metro Halifax contributed just over $1.5-million to NS provincial political parties and candidates. Between 2005 and 2009, over one election campaign cycle, business and corporate donors in metro St. John's contributed just over $1.9-million to NL provincial political parties and candidates. Of that amount, 89% went to the PCs, 11% to the Liberals, and 0.2% to the NDP. The ratio of PC:Lib contributions was, at its LOWEST, $5.58:$1.00. In 2008, it was $17.17:$1.00. Halifax has a metropolitan population of just over 400,000, and numerous regional corporate head offices. 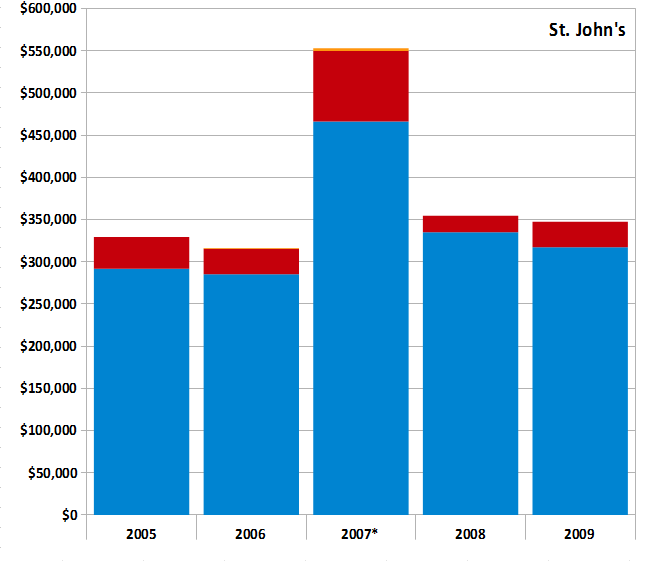 St. John's has a metropolitan population of just under 200,000, and fewer head offices. Corporate donations to parties and candidates were prohibited in Nova Scotia starting in 2010. Despite the fact growth in the province's economy is cooling, Newfoundland and Labrador will still lead the country in GDP growth according to BMO. Economist Robert Kavcic says our economy will grow by 3.5 percent thanks to construction and offshore oil projects. He says the biggest economic driver is construction, with government spending expected to total more than one billion dollars in the current fiscal year. Kavcic predicts growth will decelerate next year as fiscal stimulus winds down. thanks to energy-sector investment and a continued commitment to aggressive capital spending by the Province. But, that pace will also cool by 2012 as some projects begin to wind down. Saskatchewan is one of only two provinces (the other is Newfoundland and Labrador) on track to be in the black this fiscal year, and the only one projected to be there persistently in the future. Newfoundland and Labrador’s Public Accounts for FY10/11 and midyear fiscal update for FY11/12 are pending. In this spring’s Budget, the Province projected a $59 mln surplus for FY11/12 (0.2% of GDP), after an estimated $485 mln surplus in FY10/11 (1.6%). Budget balances were projected to switch to deficits in FY12/13 and FY13/14 ($496 mln and $310 mln, respectively), before returning to surplus in FY14/15. In response to a sudden blurst of interest in the subject on the twitters earlier today, here is a canonical listing of political contributions made by local governments since the dawn of time in 1996. All contributions have been made to parties outside of writ periods, with the exception of the first two in the table, which were election-period contributions to an independent candidate in The Straits and White Bay North. [Edited to add....] Also in 2004, the Progressive Conservative party receive a contribution of $150 from th Western Health Care Corp. This would seem to be the only such contribution on record from any of the regional health care authorities to any party or candidate. Examine the record if you’re in doubt that the provincial Tories have shifted several leagues to the left. Since taking office under Danny Williams in 2003, the current administration has grown the cost of government by 82 per cent in eight years. Most of the growth occurred in the last six years. In February 2010, Statistics Canada reported that the provincial government had 54,761 people on the payroll. That includes nurses, teachers, wardens and police officers, along with the direct line civil servants at Confederation Building. The number has increased substantially since then. In a province with a fit and willing workforce of just over 150,000, a civil service of that size is clearly not sustainable. But add to that figure the demographic implosion already under way and the looming drop in oil production and the approaching crash promises to be potentially cataclysmic. In just nine years, 26 per cent of the population of Newfoundland and Labrador will be 65 years of age or older. That’s more than one quarter of our citizens who will be retired and needing increased levels of health care and social supports. This graying of our citizenry is taking place after oil production has peaked and is already winding down. Essentially, the province has about 20 years of reserves left and they are declining. There will be a bump in production when Hebron comes on stream in six years time, but it will be short-lived. The trend of diminishing oil revenues for government coffers is clear for anyone who cares to look. Unfortunately, very few among us, including leaders in the business community and the House of Assembly, have cared, or should that be dared, to look. Economist Wade Locke has predicted a decade of provincial government deficits ranging between half a billion and a billion-and-a-half dollars annually starting next fiscal year. What has our so-called ‘conservative’ government done to prepare for and mitigate the repercussions of this looming fiscal blow? Led first by Danny Williams and now Kathy Dunderdale, they have been shovelling oil dollars into the ever growing maw of government, all for the purpose of staying popular and getting re-elected. Until the ascendance last year of Jo Mark Zurel to the presidency of the St. John’s Board of Trade, the leaders of our local business community lustily cheered them on. On that last point, this chart shows the remarkable Support for Democracy exhibited by capital-area business donors to the three political parties since the dawn of recorded history (in 1996). Remember, these figures are ONLY for corporate and small-business donors from the northeast Avalon (Bay Bulls to Conception Bay South, and points north of that line). They do not include personal or union donors from the metro St. John's area, or donors of any kind from anywhere outside the northeast Avalon. 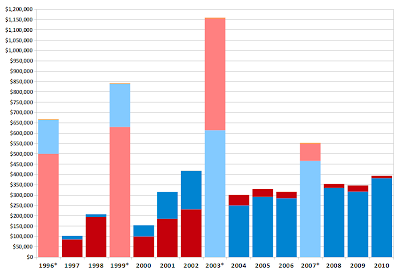 Paler colours indicate fundraising in election years, which is not directly comparable to non-election years. And yes, all three parties are represented on the chart. Barely. In 2010, the governing Progressive Conservatives raised $690,000 in reportable contributions, versus the Liberals $31,000 and the NDP's $59,000. That is the highest amount the Tories have ever raised in an off-election year. Of the PC total that year, fully $383,000 — over 55% — came from business donors in the greater St. John's area. 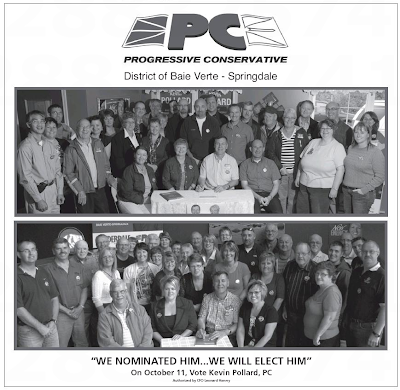 Between 2004 and 2010 inclusive, the first full year that the Williams supposed "Conservatives" were in power, the northeast Avalon business community has favoured the "Conservatives" almost nine to one over the other major parties combined. Of every St. John's area business dollar pumped into political financing in those seven years, 89.7 cents have gone to the Tories, 10.1 to the Liberals, and just 2/10 of a cent to the NDP. In the entire fifteen-year history of Elections NL financial disclosures published on the intertubes, St. John's area business donors have given a grand total of just under $16,000 to the NDP or NDP candidates — one quarter of one percent of all their contributions to all parties and party candidates during that period. The business community in St. John's clearly has something against the NDP. And their eagerness to be on the Government Side was never as enthusiastic, even in the Tobin years, as it has been since 2003. And yet, thanks in no small part to their own unwavering support for the democratic process, that same business community have been instrumental in helping to elect, re-elect, and preserve in office a government and party so left-wing it would make every NDP government in the history of Canada blush blue in comparison. Tonight, St. John's City Council is having one of its regular meetings. This will be its 37th meeting of the year. So far this year, the House of Assembly has met 33 times. From the proceedings of the House of Assembly on May 16, 2001. MR. OTTENHEIMER: Yesterday in the House, the Deputy Premier was asked directly whether the government would make a commitment that before a Voisey’s Bay deal is signed, final and binding, that the government will bring it to this Legislature for debate and put it before the people of the Province so they can see and comment on what is in the deal. Mr. Speaker, the Deputy Premier answered quite simply by saying: Yes, Mr. Speaker. The Premier, while he was Minister of Mines and Energy, on November 29 and November 30, and again on December 6, 1999, was asked the very same question here in this House and all three times he said, Mr. Speaker, no. I would like to ask the Premier to tell the people of the Province, for the record today, Mr. Premier: Will you make a commitment that before the government signs a final and binding Voisey’s Bay development deal, the government will put that deal before the people of the Province for scrutiny and input and bring it to this Legislature for debate? PREMIER GRIMES: Mr. Speaker, let me say this: I know he is particularly sensitive today. He is not having a good day and he should read the bill. Bill 10 would be the real answer, Mr. Speaker. PREMIER GRIMES: Mr. Speaker, I would ask that the critic for Mines and Energy maybe check with the Leader of the Opposition, based upon what he said today about wanting to debate outside the Legislature, whether he really wants to ask the question he just asked. Do you want the debate in the Legislature or not? Because on Bill 10 he wants to have the debate outside the Legislature, Mr. Speaker. MR. OTTENHEIMER: The Premier reminds me of the question: Are you an indecisive person? And the response being: Well, Sir, yes and no. MR. OTTENHEIMER: I ask the Premier, Mr. Speaker: What is it? Is it the position that his Minister of Mines and Energy has alluded to? Is it the position of yesterday, of the Deputy Premier? Or, is it his position of 1999? What is it, Premier? How will this issue be determined once and for all? Will the people of this Province be a part of this very significant public issue? PREMIER GRIMES: - because they do not know which particular view they want to take. Mr. Speaker, let the record be very clear on this issue. With respect to Voisey’s Bay or any other issue of significance and importance in Newfoundland and Labrador, this government’s insistence is that the people of Newfoundland and Labrador will know the details of anything that is done; and they will be convinced by knowing the details, Mr. Speaker, in every public, possible way, whether it is inside or outside of the Legislature, whatever is most appropriate at the time. They will be convinced because they will see the details. We want them to know the details because then the fearmongering and the criticism of the Opposition will be exposed for what it is. They are frightened to death to see something that is good for Newfoundland and Labrador happen. They do not want it to happen. The people of Newfoundland and Labrador will see the details inside or outside the Legislature, and we will insist upon it because we know that when they see the details in a deal that is good for Newfoundland and Labrador they will fully endorse and support the initiatives that government takes on their behalf. On Tuesday, the Progressive Conservatives under Kathy Dunderdale won 37 seats on 56% of the vote. By any standards a smashing electoral success. The NDP gains in votes, and seats, came almost entirely at the expense of the Tories. The Liberals stubbornly refused to believe their own obituaries. According to the script, this wasn't supposed to happen. And it's not just a matter of raw vote- and seat-counts. Straits and White Bay North released itself from the Liberal clutches it fell into in the late by-election, but did so without rushing back to the Tory fold. Clyde Jackman saw his political career flash before his eyes, and the NDP was strong enough to be competitive in several of the St. John's area seats it didn't win. Apart from raw margins, another indicium of the potential winnability or convertability of a district is whether the second-place party is strong enough to win polls within the district. The NDP did so in at least four Tory-held St. John's seats Tuesday night, and enough of them that it was leading in suburban Cape St. Francis in the first hour of the count. Whence the source of the nervous-nelliness. In the nine elections the PCs have won since Confederation, they ran the St. John's-area board, or nearly done so, every time — until 2011. Bell Island in 1971 and 1972, and Conception Bay South in 1975 (shown in pale shades), were the only seats in the current St. John's metropolitan area ever carried by Liberals in a general election won by the PC's. 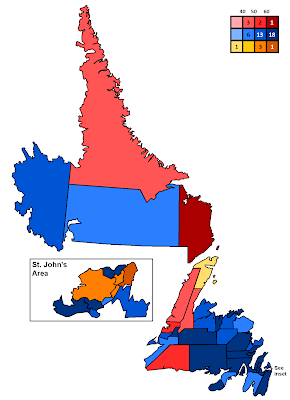 Back in the 1970s, those districts were not nearly as demographically and economically integrated with St. John's as they are today, so we can only partially debit the Tories for those St. John's-area losses anyway. 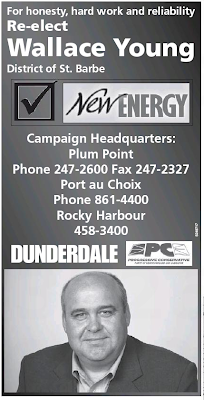 In the Danny-Dunderdale era, the NDP stubbornly held on to its long-standing single St. John's beachead in the east end/downtown/Signal Hill area, with the NDP fending off the PC juggernaut in 2003, and PC star candidacies in the 2006 by-election and 2011 general election. During the D-D era, there were only ever even two local races in which the NDP topped 1000 votes — in Conception Bay East and Bell Island in 2003 and in the 2010 by-election. This chart shows the distribution of PC seats in PC-won elections, along with non-PC seats won in the modern St. John's metropolitan area boundaries. Metro seats are to the left of the thick grey bar (the overpass? ), while rural and small-town PC seats are shown to the right. The elections of 1989 and 1993 show just how unusual, historically-speaking, was the electoral coalition built by the Clyde Wells Liberals. They were very successful in the city and suburbs, while the Tories showed a remarkable resilience in rural areas even during Liberal-won elections. The two Tobin-era elections showed the Tories gaining ground in the city, while reverting to the historical pattern of having a caucus comprised half or more of urban and suburban MHAs, even though the electoral map favours non-metro areas almost three to one. St. John's, in short, has always been the Progressive Conservative citadel. It is the core to which they retreat in bad elections, and the base from which they rebuild to have good ones. So, for them, seeing the NDP surge to four seats in the city, take out a cabinet minister and two other incumbents, and fend of what ended up being a weak challenge by a "star" candidate, was bad enough. Seeing the NDP surge to over 1000 votes in every metro district but one — Mount Pearl North, where Kurtis Coombs, of all candidates, still got 994 — is another. Seeing the NDP come to within realistic striking distance in three more districts — Conception Bay East–Bell Island, Mount Pearl South, and St. John's West — now you're talking nervous tics. 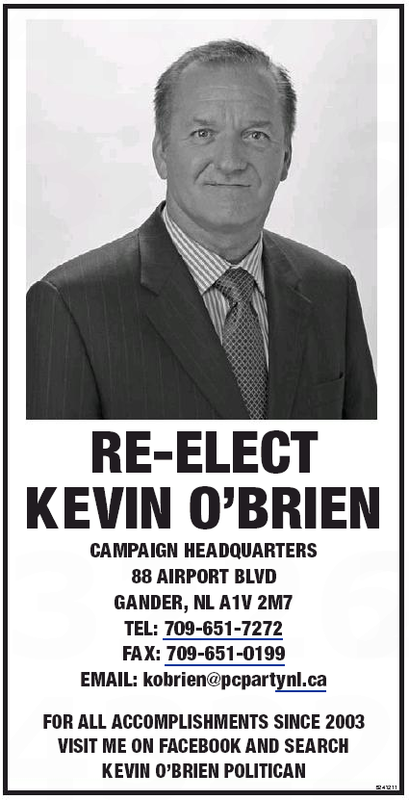 Then to have the Dippers winning polls in suburban Cape St. Francis and elsewhere across Town? Couple that with the surprising (to some people) Liberal resilience in rural areas, especially the further you get from St. John's, where the Liberal vote actually increased in eighteen districts, and you may just be gazing into something of a crystal ball that foretells the scenario by which the PC party will, eventually, fall from grace with voters. A rural flank under pressure from the other "traditional" party. An urban core where some seats are won, and others "spoiled" by vote-splits from the NDP. With the colours red and blue swapping positions, this is exactly the pincer move that has been pursued over the four federal elections of 2004, 2006, 2008, and 2011, by the federal Conservatives. The rural party failed to die on cue, and actually ended up making gains. The governing party's urban fortress is under siege by an NDP that snuck in through the aqueducts. A PC defeat wasn't in the cards in 2011. But for anyone with a little imagination, regardless of political stripe, that eventual defeat isn't nearly as hard to imagine this week as it was seven days ago. "I don't find it a place for a very healthy, open, constructive debate to start with," she told the CBC in a post-election interview. "Most of my issues are around the quality of debate and the research and the fact that you can pretty well get up in the House of Assembly and say whatever it is you like. You don't have to be concerned with truth." Dunderdale was first elected as MHA in 2003, along with 33 other Progressive Conservatives; a 34-member government caucus facing a combined opposition of just 14. 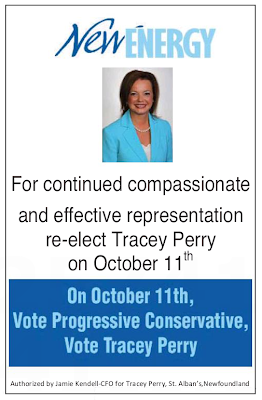 She was re-elected in 2007 as a member of a landslide 44-member PC caucus, facing a combined opposition of just four. Thirty of those 55 Progressive Conservatives, an absolute majority of the new House, were incumbents who were re-elected on Tuesday night. That is to say: Kathy Dunderdale, in her entire elected political career, has never known anything other than a House of Assembly that is overwhelmingly dominated by fellow Progressive Conservatives. So when she says that the House isn't "a place for a very healthy, open, constructive debate" — just whose fault is that, anyway? And why hasn't she, or her party, having sucked almost all of the political oxygen out of the province, ever once taken steps to change that? MR. E. BYRNE: Mr. Speaker, in view of the fact that this government, and in particular the Premier, has articulated a position on the export of ore prior to a finished processing of that product that explicitly defies the mandate the government received in 1999, I would like to ask the Deputy Premier: Will government make a commitment that before a deal is signed, final and binding that puts in place a deal that is final, that the people have to live with forever and a day, that you will bring it to this Legislature for debate and that you will bring it before the people of the Province so they can see and comment on what is in that deal? MR. TULK: Yes, Mr. Speaker. MR. E. BYRNE: Mr. Speaker, I am pleased to hear the Deputy Premier’s answer because Hansard will show that the Premier’s answer - I will get to the question if you will give me a moment, I say to the Government House Leader - to me on this question is different. I want to ask this question. It is now government policy, supported by your Premier, that if you negotiate a deal, before you sign it you will bring it before the Legislature for debate and you will bring it before the public so they may have their opportunity to debate it as well. Is that what you are saying, Deputy Premier? MR. TULK: Let me say to the hon. gentleman that this government will not hide anything that it signs or does, and that it will be debated fully in this Legislature. MR. TULK: What’s the problem? Are you trying to suggest to us that we should hide something? Are you afraid there is going to be a deal there? What’s the problem? MR. E. BYRNE: Government members asked: What are we afraid of? The government members say it will be out in the open. I can only say, are they aware - I will ask this question, you must be aware, or are you aware that the Premier of the Province, in this Legislature, said no to the question that I asked, that he would not make that commitment. MR. E. BYRNE: I am asking again, Mr. Speaker: Before this deal is final and binding upon the people of the Province, that it will be debated fully in this Legislature and that government will provide an opportunity to have it fully debated outside this Legislature in public. Is that the commitment that government is making? MR. TULK: My answer to that repetitive question is the same as it was before. Democracy Watch says there are a number of ways to improve voter turnout and make the electorate more engaged in the process. Spokesman Duff Conacher was responding to low voter turnout in this week's provincial election. Just under 58 percent of the province's eligible voters cast their ballots this time around, the lowest turnout in recent memory. Conacher says there have poor voter turnouts in other provinces and in recent federal elections as well. He says the electorate are fed up with politicians and want to see measures put in place to ensure honesty and real change. He says sometimes all it takes is a clear outline of party policy. Meanwhile, Premier Kathy Dunderdale has already announced that the Legislature will not open for the fall session. Conacher calls that decision an "undemocratic move". 2003 (and onwards): The ever lazier and lazier provincial legislature. 2005 (and onwards): The vitriolic and demagogic attacks on private citizens and public figures alike. 2006: The major ethical problem posed by a prominent and independently-wealthy politician's impulse towards ostentatious charity. 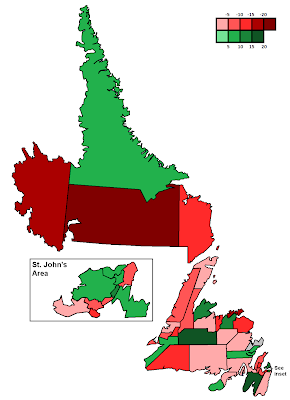 2006: The appointment of an all-partisan Electoral Boundaries Commission, instead of a non-partisan one. 2006: The attack on a sitting judge who dared to not side with the government in a legal matter. 2007: The brazen reversion to 1950s-style Duplessis-Smallwood government by carrot and stick. 2007: The appointment of a former President of the governing party as Chief Electoral Officer. 2007: The amendment of the Elections Act to allow voters to vote in elections that haven't actually been called yet. 2007 (and onwards): The mysterious non-appearance of the promised whistleblower protection legislation. 2008: The Great Patriotic War of Freedom From Information, fought on many different fronts. 2008: The partisan cook-up involving the Speaker of the House of Assembly, to throttle caucus funding for the official opposition. 2008: The attack on a judge in an official inquiry who had the temerity to, you know, inquire. 2008: The government announcing that it will just plain ignore a court decision which didn't go the way it wanted. 2009: The failure of the Chief Electoral Officer to show the least bit of curiosity about the conduct of the 2001 St. Barbe by-election, after new facts came to light. 2010: Yet another attack on a quasi-judicial body, this one conveniently out of province. 2010: The clumsy attempts to justify the Duplessis-Smallwood carrot-and-stick approach to government. 2011 (and earlier): The participation of the provincial police force's union in fundraising for the governing party. 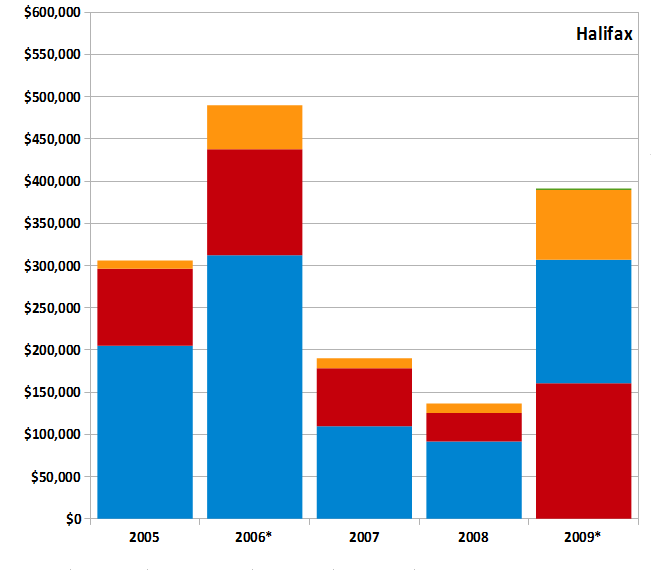 2011 (and earlier): The pattern of political finance contributions by municipal governments and other public entities. 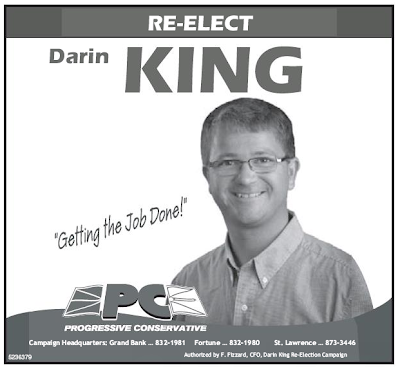 Someone might want to remind the two PC MHAs on the Burin Peninsula that they won. People are starting to notice the sour grapes being expressed by some successful candidates in the recent provincial election. Clyde Jackman, who squeaked past New Democratic Party candidate Julie Mitchell, is disappointed that Fish, Food and Allied Workers union local president Allan Moulton and Marystown Mayor Sam Synard campaigned against him. Now, Education Minister Darin King, who ran and won in the nearby district of Grand Bank, is complaining about Liberal MP Judy Foote. Quoted in the Southern Gazette, King expressed his disgruntlement with Foote for supporting the Liberal candidate Carol Anne Haley, who worked as her constituency assistant. King is quoted as saying that he "was not going to be as nice as he used to be" toward Foote. On VOCM Backtalk with Paddy Daly Thursday, caller Ben from Grand Bank expressed his surprise at the reaction. He said the only people expressing bitterness are the winners. He called the matter "childish". On VOCM Niteline with Bill Rowe, Judy Foote said King used bullying language in criticizing her, even though he won the seat. She said he had to campaign against two politicians, and he said that she picked a "fight" and he would see it through. Liberal MP Gerry Byrne, who campaigned during the provincial election, says it's a case of the pot calling the kettle black. He says less than six months ago, nine provincial cabinet ministers campaigned against him. Meanwhile, Marystown Mayor Sam Synard told VOCM Niteline with Bill Rowe that Jackman has indicated he doesn't want to work with him or Allan Moulton. Synard says the only campaigning he did with NDP candidate Julie Mitchell, with whom he worked on council, was in his home town of Parker's Cove, where he introduced her to his elderly aunt and an uncle. Synard said he was very surprised by Jackman's comments about Allan Moulton. A former Progressive Conservative cabinet minister, Paul Oram, has weighed in on the provincial election and wasted no time in castigating Synard for allegedly campaigning against Jackman. Oram said bitterness and resentment, in this case, goes both ways. If by any chance you were inclined to tell Clyde Jackman, Paul Oram, or Dr. Darin Luther King to "stay classy", just remember — you can't stay classy if you ain't classy in the first place. A blast from the ever-more-distant past. What ever became of that nice Mr. Ottenheimer, anyway? ST. JOHN'S, February 18, 2000 — Opposition Mines and Energy critic John Ottenheimer says if the province is close to a deal with Québec on developing the Lower Churchill River's hydro potential, then it's time many questions were addressed. Ottenheimer said it is of the utmost importance the public see what's in any agreement with Québec before the deal is signed. "Let's not repeat the Upper Churchill fiasco where our people were left in the dark only to discover the agreement was to the detriment of this province," he said. "Newfoundlanders and Labradorians have been promised updates since the premiers of this province and Québec announced a framework for negotiations to develop the Lower Churchill in March 1998." "It's almost two years later and we're still hearing a memorandum of understanding to proceed with the Lower Churchill development is close, possibly within weeks. It's time the premier stopped the charade and made some concrete statements and answered the many unanswered questions that rest in the minds of people in this province." Ottenheimer said before any deal is signed, the province's people need to know about: the status of river diversion; development at Gull Island; potential development of Muskrat Falls; and if the development of a transmission line between Labrador and the Island portion of the province is a part of the deal. "The province's chief negotiator and the premier have made it clear that the transmission line is an important component - an essential condition - in signing a memorandum of understanding with Québec to develop the Lower Churchill," Ottenheimer said. "The premier appears, however, to be softening on the transmission line commitment by trying to switch the public's attention over to a pipeline dream, specifically the construction of a natural gas pipeline to our province from offshore oil fields." Ottenheimer said if the province has a moral conscience and is sincere about not repeating the Upper Churchill contract, then it will take any potential deal with Québec before the House of Assembly for debate to ensure full transparency. "It would also be wise for the province to hold public hearings and update the people on any deal before it's signed," he said. While highest in absolute numbers, it wasn't the highest in relative turnout as expressed as a share of eligible electors. 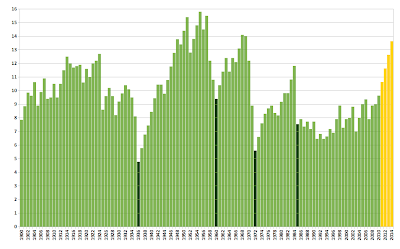 Still, Torngat Mountains has a long history of consistently high turnout. In eight provincial elections since 1985 inclusive, Torngat Mountains has had higher-than-provincial-average turnout in all but two of them, and was only off by 0.6% in 1993. Remarkably, in four of the past five elections, turnout in Torngat has been 10% or more above the provincial average. The provincial electoral history of this district, which consists of six isolated, mostly Inuit and Innu communities along the North Coast of Labrador, defies the stereotype (and, sadly, too often the reality) of low participation in the electoral process by Aboriginal people. Not only is turnout in Torngat quite healthy, so is participation by Aboriginal people as candidates. 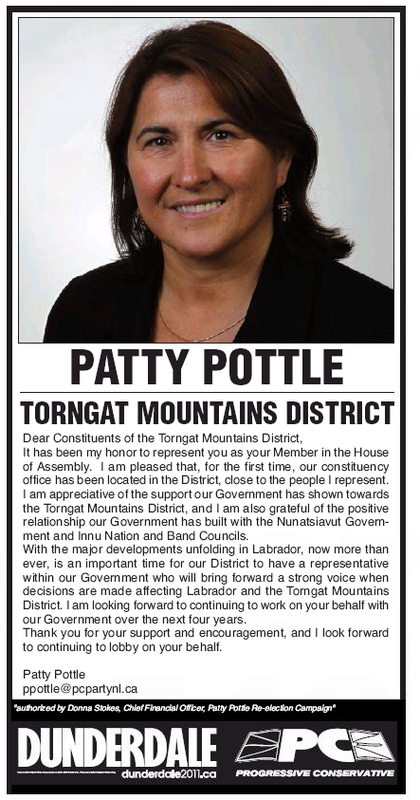 Since 1993, Torngat Mountains has been consistently represented by a native-born Aboriginal person (William Andersen III, Wally Andersen, Patty Pottle, now Randy Edmunds.) This was the first election in which all major party candidates were Labrador Inuit. 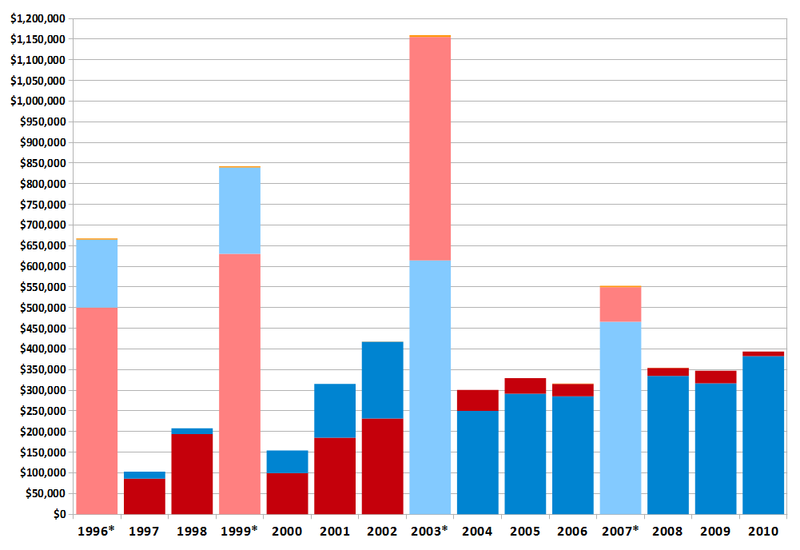 There has been at least one Innu candidate in the district, Simeon Tshakapesh in 1999. Inuit candidates also presented themselves under the Labrador Party banner in 2003 and 2007. If anyone has the total vote-list figures for 1979 (when the district was first created) and 1982, which would allow for the completion of this table, pass'em on. You can't go into the House without legislation. There's a purpose to the House. And the purpose of the House is to enact legislation. And that takes time to prepare. So by the time we get back, it's gonna be — before we get a cabinet sworn in we're gonna be talking at least two weeks or more. And then, time you prepare legislation, get it all written up, get it through its various processes, cause they are stringent, you know, we're talking mid-December. Exhibit A: the whistleblower protection bill, promised by her party for the first session of the last legislature, in 2008, still missing in non-existent consultations, non-existent study, and non-existent drafting. The source data is the age of all partisan provincial (and one territorial, plus pre-Confederation Newfoundland) governments, calculated by assigning an age of "1" at the end of the calendar year in which the party took office. Some provinces which had non-overtly partisan legislatures early in their history, as well as the two "consensus" territories, are excluded, as is the federal Parliament. Transitions from one party leader to another do not impact the calculation of age. For example, the PQ government in Quebec keeps "aging" from Parizeau through Bouchard to Landry. Several notable historical trends are obviously visible. By the mid-1930s, the Great Depression had cleaned the clocks of incumbents right across the country. 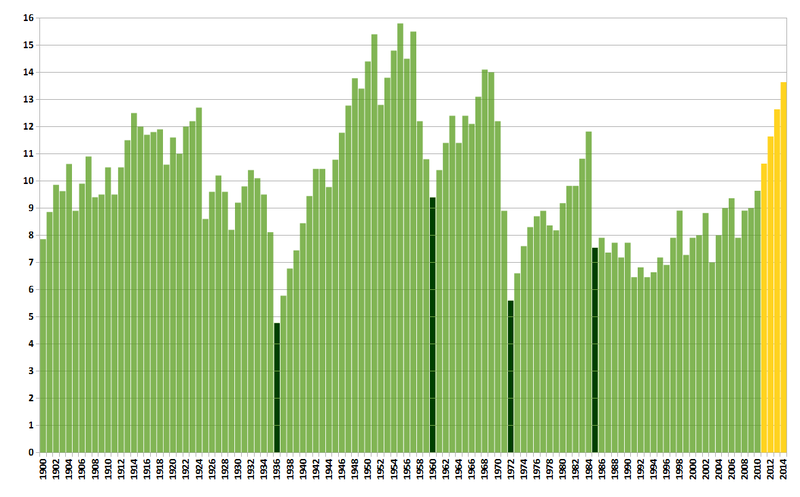 (Along with other episods of government-replacement, the bar for 1936 is shown in dark green). Their replacements benefitted from lingering resentment of governments that got blamed for tough times, then the War years and post-War boom, to set records in many provinces for long-lived administrations. This was the era of Smallwood, Duplessis, Angus L., Ernest Manning, Tommy Douglas, Wacky Bennett, and the birth of Ontario's Big Blue Machine. There was a bit of a "correction" in the late 1950s, bringing the average age of incumbent governments back to the long-term historical average of just under 10 years, followed by another period of stable incumbencies through the 1960s. However, from about 1968 to 1972, voters in every province except PEI and Ontario turfed incumbent parties, and nearly did so at the federal level in the minority election of 1972. This episode has been called by some wag, "the Great Housecleaning." There then followed another period of incumbency advantage, ending with a bunch of turnovers in the mid-1980s, most notably in Ontario and Quebec. This also coincided with the era of the 1984 Mulroney federal PC landslide. Through the rest of the 1980s, incumbents continued to lose advantage, including the defeat of the ex-Peckford and Hatfield PCs in Atlantic Canada. After the huge federal turnover election of 1993, incumbency advantage began to grow again, and has trended mostly upwards ever since. other incumbent parties who face elections in the next four years are also successful in their bids. If some, or even most, of those conditions are met, the average age of incumbent provincial and territorial governments in Canada will be approaching record highs. Hands up, everyone who thinks that trend will continue in a linear progression. Both hands up, everyone who thinks that trend will continue if 2012, if not 2011 already, brings the second of a double-dip. In an interview with CBC Newsworld earlier today, Premier Dunderdale speaks again of her plans for the proposed Muskrat Falls project "as we move towards sanction, hopefully in the spring." That would be spring, 2012, presumably — though one might hesitate to make that assumption. To ensure this project has every opportunity to move forward, the Provincial Government is leading its development through the Energy Corporation. The Energy Corporation has established a comprehensive and clearly-defined project execution plan and will continue to advance the project on multiple fronts, including engineering and the environmental assessment process, analysis of market access options and market destinations, and a financing strategy. The project is targeting sanction in 2009, with in-service of Gull Island in 2015. This is not the change in turnout as calculated V/E where V is the number of votes cast and E is the number of electors. As noted before, the value for E is questionable. Instead, turnout change is calculated here as V(07)/V(11), the change in the total number of people who voted in 2011 as compared to 2007, rendered as a percentage (plus or minus). While this allows for the Permanent Voters' List Is A Work Of Fiction problem, it introduces a different problem of its own, in that some of the change in turnout measured this way is accountable due to simple demographics: some districts have gained population in the past four years, others have lost. Still, it's striking that the biggest gains in raw turnout were seen in the St. John's area districts where the NDP saw pickups or large gains in support, while the worst declines were in the two larger centres in Labrador. Two other districts with large increases in turnout need to be starred, as the Liberal candidacy problem in 2007 seems to have depressed the baseline in Grand Falls-Windsor–Buchans and Placentia—St. Mary's. This map shows a tale of two provinces. 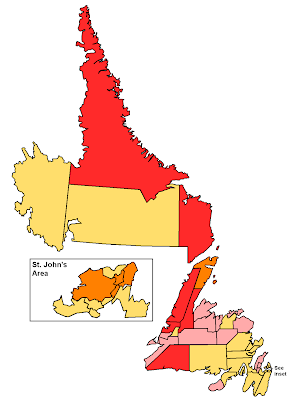 The two contrasting patterns — NDP dominating St. John's, the Avalon, and eastern Newfoundland, with pockets of support elsewhere in regional county towns; the Liberals strongest in western Newfoundland and fisheries-oriented coastal Labrador and Newfoundland districts — help explain why the pollsters and spreadsheeters didn't pick up on what was trending anecdotally. It also suggests how they missed the second and third headlines of the evening, namely, the rot that has set into the PC citadel of St. John's, and the failure of the Liberal party to die on cue. Next time, guys: regional oversamples, OK? Here are the provision results of tonight's Newfoundland and Labrador election, cleverly mapped by party which carried each district, and further colour-coded by the strength of the candidate's victory. The results are divided into vote shares of less than 40%, 40-50%, 50-60%, and greater than 60%. The number of seats carried by each vote share is also indicated in the legend. The paler colours give some hint as to where the back-roomers will be thinking about target-hold and target-pickup strategies for October 2015. The base map, brazenly borrowed from Wikipedia, omits Lake Melville for some reason, but is otherwise a nice one to work with. A letter from Colonial Secretary Glenelg, to Newfoundland Governor Prescott, in response to an 1835 petition from residents and merchants in Ivucktoke and Sandwich Bays, Labrador. Originally published as one of the exhibits in the Labrador Boundary case joint appendix of exhibits, it has been digitized by MUN library. Despite the optimistic note, it would in fact be 111 years before the unelected Commission of Government first granted Labradorians the right to vote and be represented, in the 1946 National Convention election. Labrador did not vote in its first legislative election until after Confederation in 1949. So you — go vote. LORD GLENELG TO GOVERNOR PRESCOTT. I have to acknowledge the receipt of your despatch of the 24th May No. 31, enclosing two Petitions addressed to you by persons settled on the Coast of Labrador, deprecating the passing of a Bill which had been introduced into the House of Assembly of Newfoundland for regulating the Salmon Fishery of the Colony. As that Bill was not eventually presented to you for your assent, it is unnecessary for me to allude further to it, but I proceed to notice the other topic in these Petitions, to which you have invited my particular attention. The Petitioners protest against the right of the Legislature of Newfoundland, in which they are not represented, to make Laws binding on them, and record their belief that they are still under the authority of the King in Council expressing at the same time their wish to remain so. In this view of their situation the Petitioners are evidently in error. By the Statutes 49, Geo. III., C. 27 & 6 Geo. IV., C. 59, as well as by the Royal Commissions to Sir Thomas Cochrane and to yourself, the Coast of Labrador to the Eastward of a line drawn due North & South from the Harbor of Ance Sablon to the 52° North Latitude is annexed to the Colony of Newfoundland. The authority therefore of the Legislature of Newfoundland to pass Laws for the Government of the Settlers at Labrador cannot be disputed; but at the same time the claim of those settlers to be represented in the Colonial Legislature demands, & ought to receive a deliberate consideration. You will accordingly inform the Petitioners, while pointing out to them the error into which they have fallen, that you will be ready to recommend to the favourable notice of the Council and Assembly of Newfoundland any Petition which they may address to those Bodies, putting forward their Claim to be represented in the Colonial Legislature. 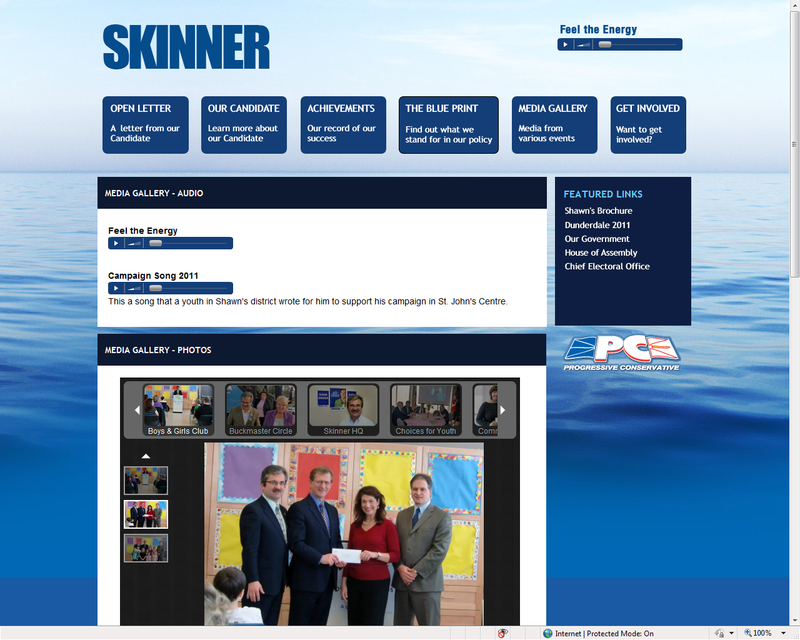 Bonus imitation: Skinner has a campaign theme song, too! The latest edition of the paper is notionally dated Tuesday, October 11th. It is in distribution today. for the purpose of promoting or opposing a political party or the election of a candidate. if the advertisements, announcements and other matters are done in accordance with the guidelines of the Chief Electoral Officer. (3) A person who broadcasts or publishes an advertisement contrary to this section is guilty of an offence. Left to right, they are NL PCs (2003-present), NS NDP (2009-present), ON NDP (1990-1995), MB NDP (1981-1988), MB NDP (1999-present), BC NDP (1991-2001), NB PC (1999-2006), QC PQ (1994-2003), ON PC (1995-2003), ON Lib (2003-present) and AB PC (1992-present). The growth rate of the provincial public service in Newfoundland and Labrador between 2007 and 2011 (13.3%) is unmatched over an identical time period by any of the governments in this sample except for the late years of the Landry PQ government in Quebec (peaking at 16%), the Stelmach PC government in Alberta (14.3%) , and late in the first term of the Gary Doer NDP government in Manitoba (14%). More specifically — hi, Mark Whiffen, how you doin'? — the Progressive "Conservatives" under Danny Williams, during his second term, inflated the public sector at a rate comparable to, or faster than, every single NDP government that has been in office in any province since Statistics Canada started keeping track. The only exception is Nova Scotia, where the Dippers haven't been in office long enough to make an apples:apples comparison, but where so far, they have also had a better record of getting provincial expenditures under control. So, can anyone figure out why it is that anyone who is a fiscal conservative would ever support the Conservative-in-name-only Dunderdale2011s? All this comes at a time in which our population growth is declining and aging. The burden of Muskrat Falls will be heavy on our taxpayers as well as our ratepayers. Here are some population figures. It's not entirely clear where Cashin the authors got those "figures", but they are already more optimistic than the population projections which Nalcor submitted to the Public Utilities Board, which are. As this corner has previously noted even these figures are already over-optimistic and out of date: the latest Statistics Canada estimate pegs the population of the entire province at under 511,000. The truly relevant population — that of the Island Interconnected service area — is even smaller, excluding, as it does, 25- to 30,000 in Labrador, plus several thousand more living in isolated diesel communities in Newfoundland. A most interesting pattern emerges in canvassing the local community papers (and the Western Star) for PC candidates' campaign advertising. 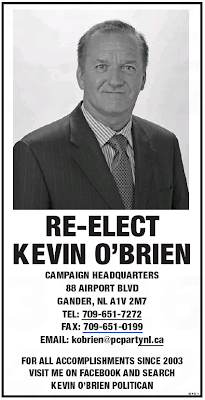 First off, there are about 10 PC candidates who seem to have eschewed newspaper advertising altogether, unless they have ads planted in editions that have just gone to press for distribution on Sunday or Monday. 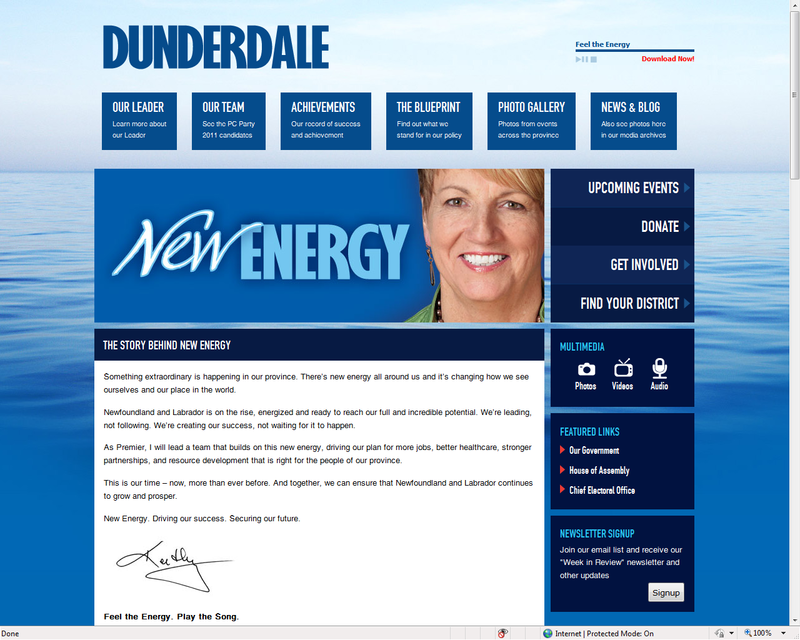 Second, most of them use two graphical elements from the provincial party campaign's bag of goodies, the "NewEnergy" logo, and the bizarre attempt to rebrand the party as "DUNDERDALE2011". 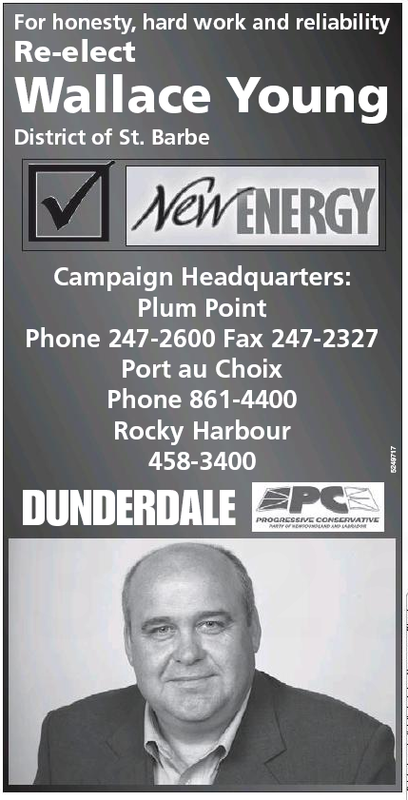 Yours truly has found eighteen PC candidates who have placed ads in the last week which dutifully include the "DUNDERDALE2011" branding. But on the other hand... then there's these guys. - What would happen if oil production was interrupted because of technical problems or an environmental catastrophe? - What if oil prices plummeted? - What "other revenue sources" could we reasonably and quickly marshal to take the place of offshore royalties? There has not been much talk of any of those scenarios in this election. Only a determination to exercise prudence and care in spending the income generated by oil. Perhaps, in the midst of plenty, this is a debate politicians can't stomach right now. But it’s a talk that needs to happen once the campaign buses have been parked and the placards put away. It's actually a talk that needed to have happened starting in 2006. That was just after Danny Williams cashed the "we got it!" cheque, resulting from a campaign in which no one — literally, no one — in the local press called Williams out on the inherent contradiction in supposedly wanting to be a "have province" and collect equalization at the same time. And that was the precise moment when, having lost precious CRA popularity points during the 2004-2005 battles with the public-sector employees, Williams resolved to fix the poll problem, permanently, by hiring more of them, and paying them more money. The monstrous ramp-up in public spending was not invisible. It was plain as day for anyone who bothered to look. A few of us looked. None of us who did own transmitter towers, or purchase ink by the hectolitre. Perhaps the politicians can't stomach this talk during a fart-and-you-miss-it election campaign. They can't stomach it outside the writ period, either. But the past eight years of passivity and silence, on big issues and little ones, from what used to be an active political press gallery, is nothing short of astounding. Something doesn't add up. Literally. In the 2006 federal election, there were collectively 17,727 federal electors on the federal list in the city of Corner Brook. In 2008, that number slipped to 17,283. In 2011, it decline further, to 16,607 — a 6% drop in five years. In the 2007 provincial election, the combined voter population of Humber East and West districts — which largely, but not entirely, coincide with the City of Corner Brook — was 14,788. In the 2011 provincial election, Elections NL puts the voter population of the two districts at 17,204. That's an increase of 16% in four years. Maybe there's been a truly massive influx of population to the suburbs like Massey Drive, Steady Brook, and Humber Village. In that case, you'd expect Humber East, where those smaller municipalities are located, to have risen in provincial voter population more than Humber West. But, no, Humber West's provincial voter population "rose" at a higher rate than Humber East between the 2007 and 2011 general elections. And it did so, even though the 2011 general election voters list lost almost 500 voters from the 2011 Humber West by-election voters list just a few months ago. The only other possible mathematical explanation is a truly massive loss of population in the smll part of the City of Corner Brook that lies in Bay of Islands district, or a truly massive increase in population in the even smaller portion of Humber West that lies outside of Corner Brook. What the heck is going on with the voters list in Corner Brook? Hydro-Québec argues that the cost of electricity associated with the project is around 6.4 cents per kilowatt hour. Bernard wonders how Hydro-Québec arrives at this figure. "When the project was first announce, Hydro-Québec estimated a cost of about 10 cents per kWh. And here they come with this new figure of 6.4. Meanwhile, the only real change, it was lower interest rates," he said. According to his calculation, the lower rates on loans from Hydro-Québec allows a reduction of half a percent on the cost per kWh, and no more. According to him, the real cost of the project would approach around 8.6 cents per kWh. "Even with a cost of 6.4 cents per kWh, it's higher than the [sale] price of 5.8 cents they reached with the Vermont for 500 megawatts over the past year. The company's main argument is that the price of electricity will increase. But we do not know what the price will be in 20-25 years. At most, we know that for 5-10 years, the price of electricity will be dominated by gas prices and the price dropped a lot and is not about to pick up," he said. Some food for thought for anyone thinking of becoming a blue-eyed sheikh by selling "robust" Muskrat Falls power to New England.